Adrenal lesions historically were diagnosed secondary to clinical manifestations of endocrinopathies. 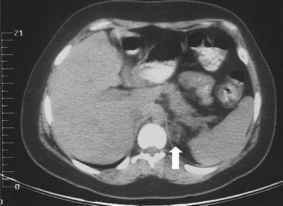 However, widespread use of abdominal ultrasound, computed tomography scanning, and magnetic resonance imaging has led to the not infrequent finding of the incidental adrenal mass. Figures 1 and 2 show typical examples of adrenal lesions diagnosed on computed tomography and magnetic resonance imaging. The differential diagnosis of an incidental adrenal mass is extensive and includes the benign nonfunctioning adenoma, hormonally active cortical tumor, myelolipoma, pheochro-mocytoma, adrenocortical carcinoma, and metastatic lesion. Patients with hormonally active adrenal tumors, such as aldosteronoma, Cushing's syndrome, cortisol-secreting tumors, or pheochromocytoma should generally undergo surgical removal (2,3). Thorough hormonal evaluation of these patients is critical because pre- and postoperative considerations regarding hypertensive control, electrolyte imbalances, and fluid shifts are paramount to ensure good surgical outcomes and minimize complications. A summary of standard laboratory tests in the evaluation of an adrenal lesion is listed in Table 1. Occasionally, medical magement of aldosteronomas may be satisfactory to circumvent the need for surgical management, particularly in patients who are poor surgical candidates (4). However, side effects of pharmacotherapy may become intolerable. Hormonally inactive tumors have traditionally been managed according to size. ■ Hormonally inactive tumors less than 3 cm in size are almost always benign adenomas and generally require no further treatment unless an increased in size or clinical signs of hormonal activity are detected. ■ Nonfunctional lesions between 3 and 5 cm in size generally require close follow-up with serial imaging studies every six months. These lesions should be removed if tumors demonstrate interval change in appearance or develop endocrine activity. ■ Hormonally inactive tumors greater than 6 cm in size are worrisome for adrenocortical carcinomas, and thus surgical excision is recommended given the aggressive nature of adrenal cancer (5). In one meta analysis, 105 of 114 adrenocortical carcinomas measured 6 cm or greater in diameter (6). All lesions which are 5 cm or greater in size on computed tomography scan should be removed because computed tomography scan tends to underestimate the size of lesions by as much as 1 cm (7). ■ Open radical adrenalectomy with possible en bloc resection of adjacent organs is the preferred approach whenever adrenal carcinoma with local extension into adjacent organs such as the kidney, colon, or spleen, is a concern (8,9). More recently, improvements in radiologic imaging techniques such as unen-hanced and delayed enhanced computed tomography with densitometry, chemical-shift magnetic resonance imaging, and NP-59 scintigraphy have further assisted in differentiating benign from malignant neoplasms (10).